The Ralph Braun Foundationopened itsfirst funding cycle of the year on January 1, 2016. The application for grants for wheelchair accessible vehicles will remainopen for one month, closing at midnight EST on January 31st. The grants for wheelchair accessible vehicles may cover up to 25% of the cost of the lift, conversion, transfer seat, driving aid, etc., with a cap of $5,000. Grants will be awarded andapplicants notified on February 15, 2016. More information can be found on their website: http://ralphbraunfoundation.org/. Not in need of an accessible vehicle? Consider donating to the foundation. Your money helps bring smiles to people like f our-year-old Braiden, who loves how easy it is now to attend all of the same activities as his big sister in his family's wheelchair accessible van. With help from The Ralph Braun Foundation, Superior Van & Mobility, and the Spina Bifida Association of Kentucky, Braiden and his family are now on the road to mobility freedom with their BraunAbility conversion! 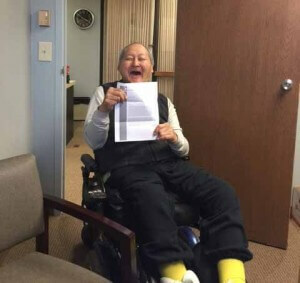 And then there's Mr. Lee, who was so excited to receive his award letter from The Ralph Braun Foundation. He has been in a wheelchair for over 35 years following an unsuccessful hip replacement surgery in Korea. He is eager to regain his independence once his wheelchair accessible van with a new BraunAbility conversion is delivered. Take it from these smiling faces-mobility is critical to quality of life! 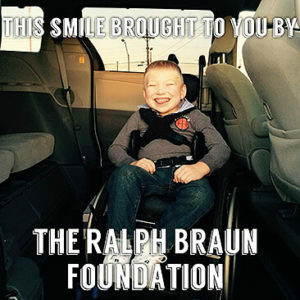 If you or someone you know requires assistance, consider applying for a grant from the Ralph Braun Foundation.